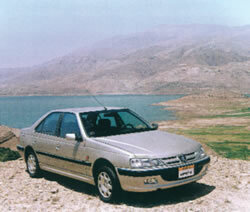 Iran Khodro Industrial Group produced 435,435 motor vehicles during the Iranian year 1382 (ending 20th March 2004) thus setting a new record in auto production in Iran. The management now seeks to enter the international market, to work together with the major international producers more than ever before. Here are the views of Dr Manouchehr Manteghi, the Managing Director of the Group. Events- How would you assess our present capability and facilities as a motor vehicle producing nation? Manouchehr Manteghi- Well, to begin with I must point out that Iran has made enormous progress in this fi eld, particularly in the last decade. We now possess suffi cient technical know-how and knowledge as to be able to produce quality vehicles and parts. Of course, we must make further progress and attain higher technological levels such as to compete with best international brands. But we do presently have human resources that possess adequate knowledge and skill for designing, producing, and engineering motor vehicles under modern technical management as well as effective quality management, and that is the greatest asset any nation could hope for. We do, of course, already have cooperation with international auto manufacturers, both European and Asian, but what we plan to have in future is even closer cooperation with the most reputable manufacturers to become the largest and most economic producer of the region. We have three main production strategies: waste free production, lower costs of design and improving production methods. Towards these aims we have already begun working on Peugeot 206, Peugeot 307 hatchback and Peugeot 307 saloon cars. We also intend to work with Mercedes Benz to produce an E/F class model of Mercedes and the common L90 platform working with Renault-Nissan. These are the main projects planned to be implemented from 2005 onwards. 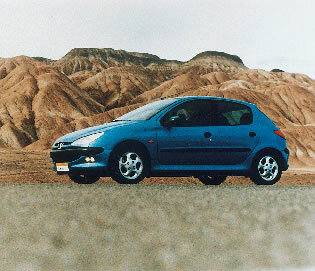 The Peugeot 206 is a car that can compete with foreign models as regards appearance, quality, technology and price. It is a good starting-point for exports. The platform X90 produced in cooperation with Renault and Nissan is intended for low-priced vehicles and in medium (B/C) class of sizes. The L90 model is based on the X90 platform which can be used for many other models including vans. It has the advantage of being capable of using both gas and petrol, adequate passenger space and various sizes/ capacities of engines. E- What are your marketing strategies for exports? MM- We intend to base our products on specifi c markets and their needs. Our studies indicate that we have excellent comparative advantages to enter international markets. We have enough potential to gain a good share of the regional market. Our satellite company SAPCO already has an excellent market abroad for the parts it produces. I am very optimistic with regards to exports in 2004-2005. E- You mentioned automotive parts, and that we already export some parts. What are your plans for enlarging the quantity of parts being exported? 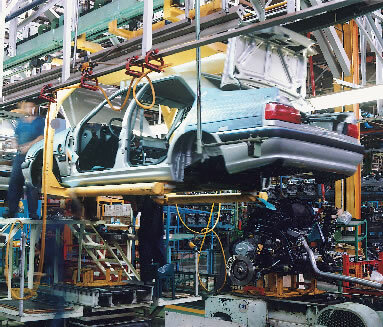 MM- The growth in the production of auto vehicles in Asia provides an excellent opportunity for our parts manufacturers. They can make use of our unique resources such as a large young educated population and vast natural resource to become the center of parts production in the Middle East. Presently we have around 2,200 parts manufactures in Iran of which 1,100 are exporting their products. In fact last year they exported 850 million dollars worth of parts. E- After sales services always present an enormous challenge to auto producers. What do you plan to do in this regard? MM- A manufacturer's biggest asset is loyal clients. We must deliver good quality products that would require the minimum of after sales services, and support the high quality with a high standard of services because accidents always occur and things can always go wrong. For this reason the year ending 20 March 2005 has been named by Iran Khodro as the “Year of Expansion of After Sales Services.” We intend to restructure the services which are presently offered to our clients. But we must raise the level of quality of our cars to such an extent that almost all the work done by the service stations are normal maintenance services. E- Are you considering the possibility of lowering prices? MM- Well, prices are already down in practice. You see, we have kept our prices stable during the past three years despite price rises and despite an infl ation rate of more than 20% in our economy. This means an effective price decline, which you will agree is quite considerable. This has been made possible through remarkable cut down on wastes, increase in production and decline in overhead expenses, but if infl ation continues at the current rate auto producers will be forced to raise their prices.